This man, who was ‘small in physical and social stature, driven by his double smallness, refused, in his smallness, to be small’. 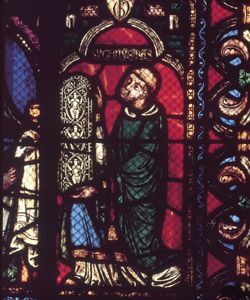 This epitaph conveys the iron will of Abbot Suger (1081–1151), who was born near Saint-Denis and became an Oblate at the age of ten. Provost then abbot of Saint-Denis, he travelled extensively and had a special relationship with the pope, bishops and kings, serving as adviser to Louis VI and Louis VII. Starting in 1135, he devoted himself to the reconstruction of the old Carolingian building. From 1140 to 1144, ‘in three years, three months and three days’, as he put it, he built a new chevet flooded with light. This prestigious structure was a reflection of the rapidly expanding Capetian kingdom. A product of the synthesis of European technical experiments, the chevet was linked to a theological conception of light inspired by the mystical texts of the pseudo-Denys, one of the fundamental references used in teaching at the time. Thanks to his innovative architectural vision, Suger sanctioned the birth in the Île-de-France of what Italian detractors of the Renaissance disdainfully termed Gothic art. The bright new chevet was better suited to the display of the relics of saints venerated by the pilgrims who were arriving in increasingly large numbers. The exiguity of the Carolingian crypt, where the relics were previously kept, had indeed led to major problems during pilgrimages. The crowds were so thick that, according to Suger, some women found it oppressive and fainted, or died uttering harrowing cries. 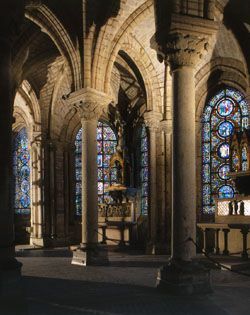 In addition, the architectural originality of the chevet, whose upper sections were rebuilt in the 13th century, resided in the use of a forest of monolithic columns, supporting one of the first ribbed vaults to be successfully built. The chevet was consecrated on June 11th in 1144, during a procession led by King Louis VII and Queen Eleanor of Aquitaine. About twenty bishops, numerous abbots and the papal legate transported the three silver reliquaries of the holy martyrs from the dark, narrow Carolingian crypt to the new chevet. Set in a magnificent gleaming gold and silver altar that has since disappeared, the relics were bathed in light and visible to all, from every part of the church. 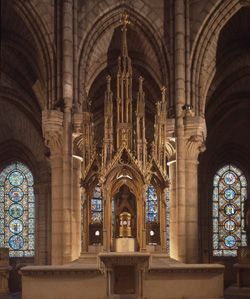 Today, the 19th-century altar still houses three reliquaries containing bones.